Chicago-based choreographer Molly Shanahan and her Mad Shak Dance Company presents the world premiere of “The Delicate Hour” Wednesday, Jan. 16 at 8 p.m. in the Lawrence University Warch Campus Center. 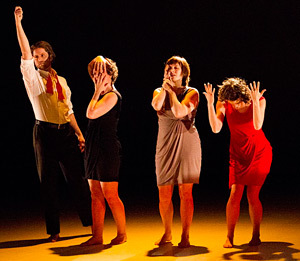 The performance, the third in Lawrence’s 2011-13 dance series, is free and open to the public. The work is the latest iteration of the company’s multi-year project “Stamina of Curiosity” and a “movement sequel” to the critically-acclaimed “Sharks Before Drowning.” The work’s title, “The Delicate Hour,” was inspired by Shanahan’s attempt to describe the haunting hour of sunset she experienced during a 2010 artist residency in Pennsylvania. In addition to the performance, Shanahan and Mad Shak company members Kristina Fluty, Benjamin Law and Jessie Marasa, will spend the week (Jan. 14-18) working with Lawrence students. A native of Canada and a member of the dance faculty at Northwestern University, Shanahan founded Molly Shanahan/Mad Shak in 1994. She was named a 2007 Chicago Dancemakers Forum Lab Artist for the creation of “My Name is a Blackbird,” for which she was awarded a 2008 Choreographic Fellowship from the Illinois Arts Council. In 2010, Shanahan received the Meier Achievement Award from the Helen Coburn Meier and Tim Meier Charitable Foundation for the Arts. Her work has been performed at venues throughout North America.